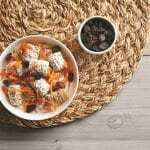 Carrot Cake Frosted Wheat Bowl | JPMA, Inc. In small bowl combine yogurt and cinnamon. In serving bowl arrange frosted wheats cereal and yogurt mixture. Sprinkle yogurt with carrot and raisins. Serve immediately.